Your 'Branding' page is where you manage if/how your brand displays to each of your services. Fill out this page if you want your network brand to be applied to each of your services. 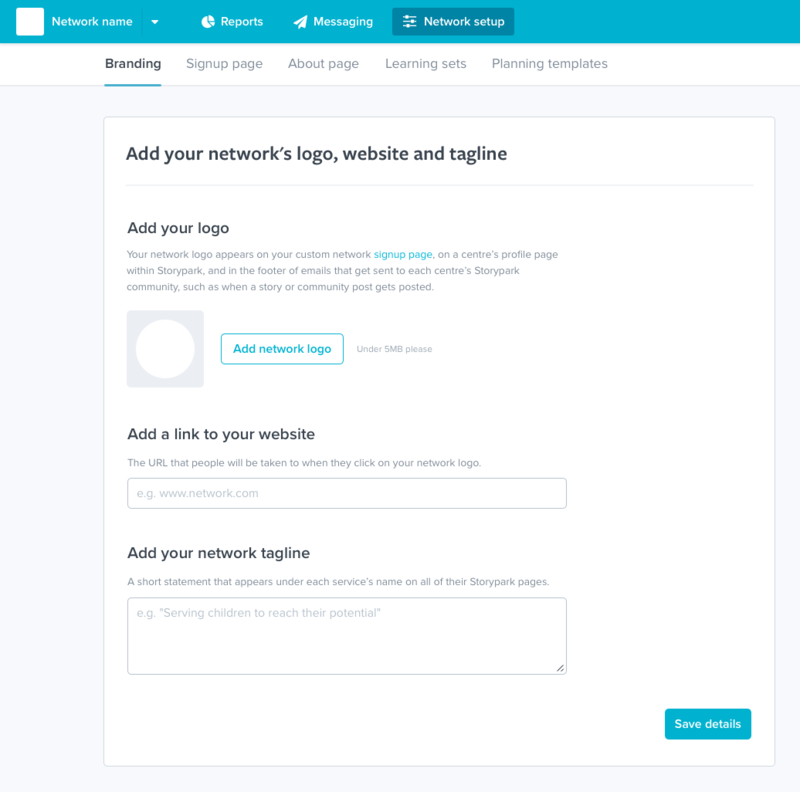 To access this area go to your 'Network setup' and select 'Branding'. 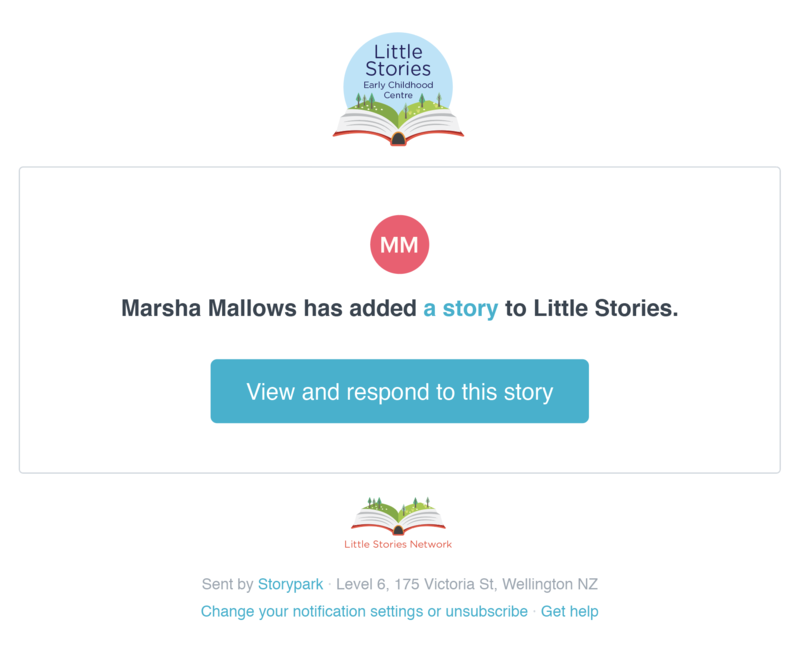 in the footer of emails that get sent to each service’s Storypark community, such as when a story or community post gets posted. You can edit any uploaded logo by hovering over it and selecting the 'Edit' button. You can then rotate or crop it. Once you've added a logo, add a URL, eg. www.your-networks-website-address.com so that when someone clicks on your logo in any of the above places they will be taken to this website. 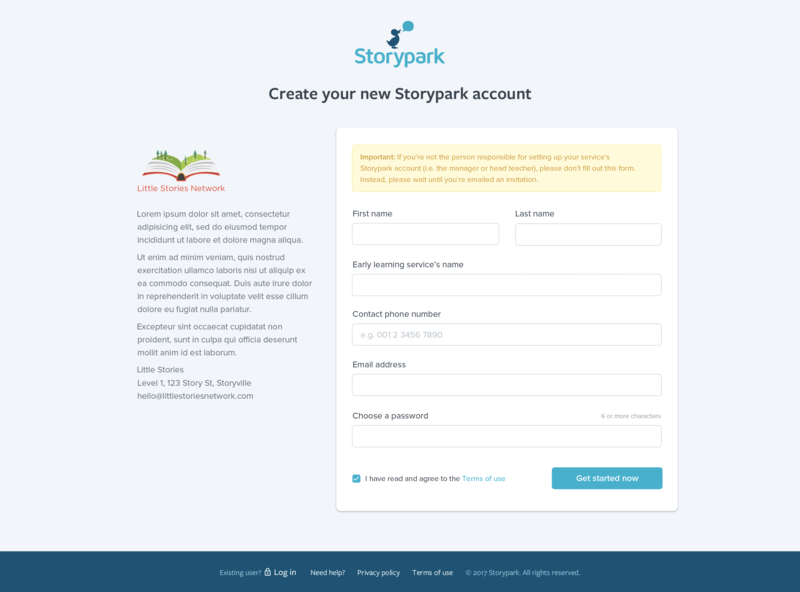 This might be your network's website homepage, or a page where you talk about how your network uses Storypark. Add your network tagline (a short statement that sums up your offering or philosophy, eg. 'Serving children to reach their potential') if you want this to appear under each service's name on all of their Storypark profile pages. Uploaded logos will be scaled to fit their specified area within Storypark. You'll get the best result if your logo has a similar width-to-height ratio, ie. it's relatively square. Logos that are extra wide, or extra tall won't display well as they will become too small to see. For the best quality image, upload a logo that is larger than it appears on Storypark, ideally, at least 300px wide and 300 px high. If you start with a logo that is too small it will be scaled up and look fuzzy in both Storypark and your emails. You'll get the best results if you upload the original design file of your logo as a high quality PNG or a JPG. If you don't have either of those, you may be able to find your logo on your website/intranet, or through a Google search, right-clicking and selecting 'Save as'. Be careful with this method though because if the image is too small or on a coloured background it will not display well in Storypark. Once you've uploaded a logo you can it within Storypark, but if you need to first resize or adjust parts of your logo, you can do this if you have an image editing programme on your computer. Alternatively, you could find an online tool by doing a Google search such as 'crop, resize, edit images online', and following the instructions.